Several times I have mentioned my love for breakfast, which may be at any time of the day. The thing is in Chicago most breakfast spots pack out within the first fifteen minutes of the doors opening for business. This past weekend I decided to get out of bed early enough to try a restaurant that was supposedly known for wonuts — waffles prepared like doughnuts. 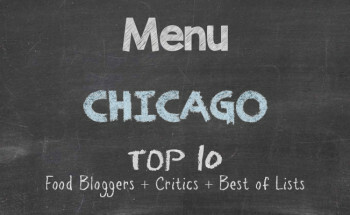 Well, after a bit of waffling around, I figured I would add my experience to Chicago Alphabet Soup. 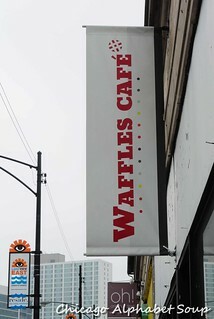 Waffles Cafe in Chicago’s Lakeview neighbourhood at 3611 N. Broadway was my destination for sampling a variety of different waffles. It is neither a big box nor is it a hole in the wall. Small in size, but still comfy, it’s a sweet spot for some breakfast bliss. Upon entry, the host was a bit of a space cadet. That all changed when the camera came out of the bag. My server was outstanding and recognized that I was ready to release the Kraken — that being my appetite. Actually, I think she heard my stomach growling, as did the two at the table next to me who started snickering. I had checked out the menu online on the bus ride to the restaurant, so I had an idea of what I wanted. However, there were so many options. So I decided to do a flight — a flight of hot chocolate and a flight of waffles. The hot chocolate came in dainty little cups. There were caramel, Mexican hot chocolate, and toasted marshmallow. Now that I have a lumberjack beard, complete with wild moustache, each sip left whipped cream across my upper lip making my moustache match the white in my beard at the chin. Each flavour had won me over to the point where I wanted another flight. I had to wait on that to see if my belly would be okay with another flight, considering I had ordered a flight of waffles. Now, I have had a flight of pancakes at Orange in Roscoe Village and thought those were cute. What I got at Waffles Cafe was more than I had expected. There were four waffles — green tea, Mexican chocolate, red velvet topped with strawberries, and liege with apple compote. One thing I must say is that the waffles had a hint of the flavouring. All while I worked my knife and fork on the breakfast beauties, I wondered if the taste had been a little more prominent if I would have liked the waffles more than I did. Given I didn’t use any syrup, the accompanying dollops of flavoured whipped cream were perfect as highlights. My favourite was the Mexican chocolate, and I swear that was a hint of Kahlua in the recipe. 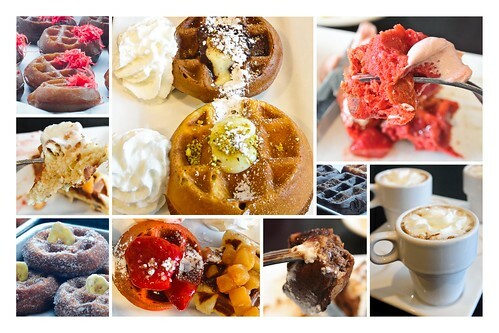 The green tea waffle was my second favourite, followed by the red velvet waffle, and finally by the liege waffle. There were several customers who had come in to get to buy wonuts for take-away. The wonuts looked inviting, all of a variety of offerings — chocolate covered, cinnamon coated, drizzled, Oreo crusted, blueberry, and other options. I had bought some doughnuts from Somethin’ Sweet in the Cragin neighbourhood, so I did “window shopping” only just to see what wonuts were available in case I should return to Waffles Cafe. Overall, I enjoyed the breakfast and will go back soon, considering I did not have to stand outside waiting for a seat the way you have to at most breakfast shops on the North Side. Many may not be a fan of the waffles not being packed with sugar. If you’re adding syrup, a waffle upping your glucose level may not be a wise delicacy to indulge. But to each his or her own. And to me, I have just made a calendar notice for a return visit in the upcoming weekends. No more waffling. Release the Kraken!